Students give up the comforts of home during the rainy season to protest the state’s education cuts. Sociology student Daveon Logan keeps trying to warm up his tamale, but each time he turns on the microwave, the power goes off, taking the lights out with it. “See! 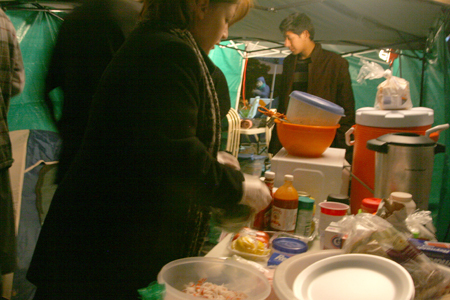 I said no microwave!” shouts Esperanza Ortega, who is making a crab and shrimp ceviche dinner for a tent full of about ten students at the Occupy ELAC encampment at East Los Angeles College on Sunday night. Organizers and students who joined Occupy ELAC this past week in protest of education cutbacks are gathered in the camp’s main “study tent” for dinner. Ortega, president of the ELAC Students For Political Awareness, is the camp’s “mama bear” and one of the organizers. As she calmly prepares dinner in their makeshift kitchen, others rush to fix the power. When it suddenly starts raining, Logan and the others spring into action to reinforce their tent with everything from electrical tape to aluminum foil. Despite their efforts, rain begins pouring into their shelter. Many of the Occupy ELAC participants appear to be taking the bad weather in stride. “We picked the greatest time, literally the rainy season. I think that shows more commitment on our part that we’re actually sticking this through,” said organizer Angie Rincon. Occupy ELAC was kicked off on Oct. 31 to protest proposed tuition fee hikes and the possible elimination of classes and semesters, organizers say. One main tent and several smaller pop-up sleeping tents now sit at the entrance of the campus on Cesar Chavez Avenue. The group has grown to over 30 participants. Most are there full-time, and others part-time. All of them continue their day jobs and take classes. By taking on the Occupy movement banner, they hope to draw more attention to increasingly frequent cutbacks at community colleges, said Rincon. During their kick off, organizers decried the lack of funding allocated toward education in the state, and called on Gov. Jerry Brown to visit their campus and address a $400 million cut to community college funding. “Community college is the main portal of entry for secondary, post-education for most low-income, minority students, so we have to keep the core classes open and also affordable,” said organizer Herlim Li. Li is calling on state legislators who represent East Los Angeles College to visit Occupy ELAC’s camp and to listen to their demands. While decisions to raise fees and cut courses are being mulled by the district board of trustees, “more or less this is a state issue, it’s state funding,” he said. 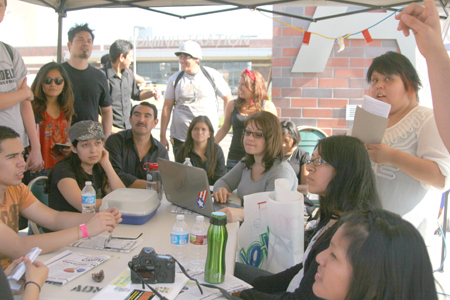 As of Tuesday, Occupy ELAC organizers were waiting to hear back from Assemblyman Mike Eng and State Senator Ed Hernandez. They are expecting Assemblyman Ricardo Lara’s director of education to visit them today. Occupy ELAC organizers say even though they know the state is having budget problems, putting money into their education is an investment. “Who is going to run the world tomorrow if we’re uneducated?” Rincon asked. Because of state cutbacks, tuition costs at ELAC have risen from $16 a unit in 2009 to $36, and there is talk of yet another $10 increase. Whole semesters could also be cut, they say, worsening an overflow situation that is felt at the beginning of each semester when 60 to 70 students pack into a 30-person classroom in the hopes of making the lottery for enrollment. Class cuts have also meant that there are never enough required courses such as English and math classes to go around. Because many students need them in order to transfer to four-year colleges, some organizers say students have to postpone their education anywhere from a semester to a year. Engineering student Keanu Paar said he was “not okay” with the elimination of a transportation card that he used to get from Pasadena to the ELAC campus. As it is he does not have very much money to pay for college, and is worried that if cutbacks continue, it will become impossible for others in his family, including his younger sister, to afford college. Most of Occupy ELAC’s first week went as planned, with some supporter coming by their tent to give encouragement, while others stopped by to heckle or give criticism. On Sunday, the Occupy ELAC campers woke up to a rainstorm. The rain had created a giant puddle under their main “study” tent, and water dripped into each of their sleeping tents. Amid the mud and chaos, the camp was reconfigured under the direction of one of their members, Daniel Cristobal, who everyone has now dubbed “the general” for his quick work. The temperature has also dropped significantly, especially at night, and students are wearing layers to sleep and padding their tents with more blankets. Paar said he has been craving a cheeseburger and misses his mother. One of the main organizers said her mother was crying when she visited her recently. The students get through the day by studying and doing their homework. They play soccer, cards, hacky sack, and dance. They also make improvements to their shelter and campsite, such as creating a gravel pathway so that they do not have to stomp through the mud. Paar said Sunday even though they were getting “a little tired,” the situation is manageable. He compared it to the state’s budget crisis. “You know what, it’s not over yet, … [the rain storm and leaking tents] looked bad, but it’s fixable. Like these budget cuts, it’s a big problem, but it’s fixable,” he said. So far their occupation is sanctioned by the ELAC administration, and is supported by faculty members. Campus security guards check on their safety, and secretaries in the main offices donate food. They also received donations from the community, including from Home Depot and Lilliana’s Tamales. They continue to try to attract more interest from the community at large. They passed out a thousand fliers last Friday night during the East Los Angeles Classic Football game. But they say what they need the most now is the attention of those in charge of the state’s education budget. “We really need someone to listen. We need someone to come down here,” Rincon said. As they wait for legislators to visit them, they try not to get discouraged by detractors, as well as people who criticize how they are going about their campaign, people who wonder why there are not camped out at Occupy LA, or at the district offices. Each of the Occupy ELAC participants tries to act as a spokesperson, ready at any moment to explain why they are occupying their school. November 10, 2011 Copyright © 2012 Eastern Group Publications, Inc.
Congratulations to the OccupyELAC Huskys who are taking a stand for education. Your actions are commendable especially with this cold and rainy weather. I read in their FB page that they were also working on getting the Tax the oil company potions signed. Now that is supper productive because it is a positive step in the right direction to tax the oil companies which pay no state tax. this money would then help fund education.